There are about 600 Khmer Theravada pagodas in the Mekong Delta. Doi, which means Bat in English, is one of the most beautiful pagodas with typical Khmer architecture. Doi pagoda was built in the 16th century in Soc Trang province. The pagoda’s name in the Khmer language is Seray Tocho Mahatup. Its popular name is Doi because it’s home to thousands of bats. Doi pagoda is a museum of Khmer culture and art, reflected in the pagoda gate, main hall, and monks’ accommodations. The pagoda features Khmer architecture with engraved patterns of lotus leaves. The pagoda is in the centers of a 3-ha orchard. From the entrance, visitors can be overwhelmed by the bright, shiny yellow color that almost completely covers the entire pagoda. The four corners of the pagoda roof are engraved with Naga cobras and a tower rises high in the middle. Support pillars along the corridor surrounding the main hall are statues of Kemnar maidens with hands held chest-high in a welcoming gesture to all visitors. The walls are decorated with 28 paintings about Buddha’s life from his birth until he entered Nirvana. Inside the hall is a statue of Buddha sitting high on a lotus throne. Around the main hall are stupas containing relics of monks and houses for monks. Doi pagoda embodies Khmer architectural values and traditions. It’s a place for Khmer people to attend religious activities and festivals, enjoy cultural performances, and study. 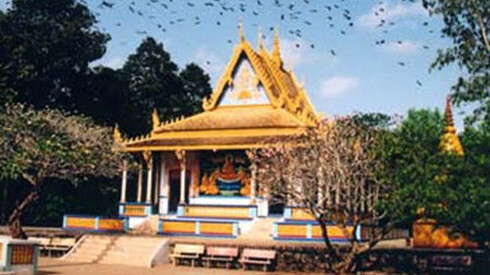 Doi pagoda’s garden filled with ancient trees and younger fruit trees is home to thousands of bats. Mysteriously, they live in the fruit trees but never eat fruit in the pagoda. When it begins to get dark, they leave the pagoda to find food elsewhere.